At Your Employment Solutions, we firmly believe that its our people that set us apart. The people who work at YES make us the best in Utah staffing because they rank among the best people in Utah. 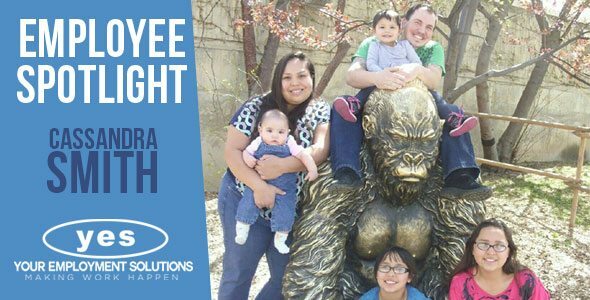 Our April employee spotlight is a shining example of that. Cassandra is among YES' best and brightest. She has been with YES just shy of three years now and has continually amazed us with her talent, time and time again. She is a very dedicated, hard worker who will stop at nothing to make sure her customers are well taken care of and get the customer service they deserve. I love spending time with my family and kids. I enjoy silence. Every now and then I like to be or hear nothing. I like to go swimming. Water has some healing powers. I enjoy cooking amazing food for my Paleo eating lifestyle. I hate excuses, they are the worse. Be honest. I hate cats, the fact of the litter box all over their little feet and they walk all over the house. NO……. We are all people tying to make a living for our families and doing the best we can. We can fail at things and bounce back with a little help and that help is always the next person away. We just need to ask. But seriously, I would want to meet someone inspiring like Oprah Winfrey. I would enjoy a sleepover girl’s night with Oprah and just pick her brain. My bed next to my husband. 7. Your April fool’s prank this year was legendary. Have you always been a big believer in practical jokes? What’s the best one you’ve ever been a part of? I love April Fools Day, especially on people who can take it. I have always been into practical jokes ever since I was a kid. It’s fun to laugh, play and mess around with loved ones. The best practical joke was on my husband. If I could of recorded this I would have. So we moved into our first apartment after getting married and all of our stuff was everywhere. Well, I came home and he was in the shower. So I took advantage of this and I hid in our walk-in closet. There was a pile of blankets and sheets on the floor that were going to go through. Well our walk-in connects to our bathroom. I waited under the sheets for a good 30 minutes until my husband walked out and I grabbed his leg and he screamed and acted like a little girl running away! lol.. It was the best. The funny thing is he said, “It's on!” instead of getting upset. Then, next week, I was pranked with a fake washer machine mouse. Look at your resume and ask yourself, “Would I hire myself?” If you answered YES, then submit your resume to Alison Evans, LOL…. YES jump to it! YES is a great environment, with a great family-oriented group of people, great upper management that listens to what you have to say, offers a great learning experience, and is overall just a great place to work. 11. YES puts you in charge of recruiting for a Fortune Cookie Writer position. President Reed Laws and VP Kerry Westenskow have both submitted resumes. Who gets the job? Why? Kerry. Even though he is Mr. Finance, he can still crack you up and make you smile for the day no matter what mood you are in. He is also older than all of us so he is VERY WISE… I’m sure he has tons of “motivational funny quotes” for fortune cookies. Thank you Cassandra for all that you do! You help make YES a great company with amazing customer service.